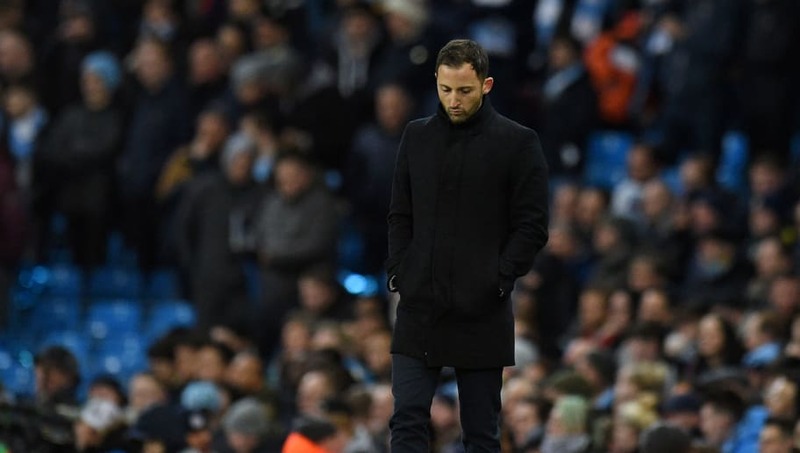 ​Schalke 04 have sacked manager Domenico Tedesco following the club's humiliating 7-0 second leg loss to Manchester City in the Champions League last 16. After performing admirably in the first leg, only to be undone by a wondrous free kick from academy graduate Leroy Sane and a last-gasp score from Raheem Sterling, the German side went to the Etihad 3-2 down on aggregate, before giving up seven goals in a torrid showing. But this is not just down to this European exit, with the club currently sat in 14th place in the Bundesliga, just four points above the relegation zone. In an official statement on the club's ​website, it was revealed that Tedesco had been relieved of his duties with immediate effect. The statement read: "Jochen Schneider had announced that the board were to meet and analyse Schalke 04’s current sporting situation. "They came to the following decision: Head coach Domenico Tedesco and assistant coach Peter Perchtold have been relieved of their duties with immediate effect. Seppo Eichkorn, who joined the coaching team after the winter break, will return to his position as head scout. "Huub Stevens will take charge of the team on an interim basis for the Bundesliga game against RB Leipzig this weekend (Saturday 16th March). He’ll be supported by Mike Büskens as his assistant manager." Speaking upon the announcement, Schneider, the club's sporting director, declared: “This decision was anything but easy, as we really appreciate Domenico Tedesco at Schalke. He developed the side very well last season that ended with us finishing runners-up. “However, we can’t fail to recognise that the development this season has been negative. When I took the job, I demanded a turnaround due to the current situation in the ​Bundesliga. "After careful consideration, we came to the conclusion that this wouldn’t be possible with the current staff."